​Hometown: Kinnelon, New Jersey, US. Died: July 8, 2012 in Operation Enduring Freedom. Unit: 2nd Battalion, 321st Airborne Field Artillery Regiment, 4th Brigade Combat Team, 82nd Airborne Division, Fort Bragg, N.C.
Spc. 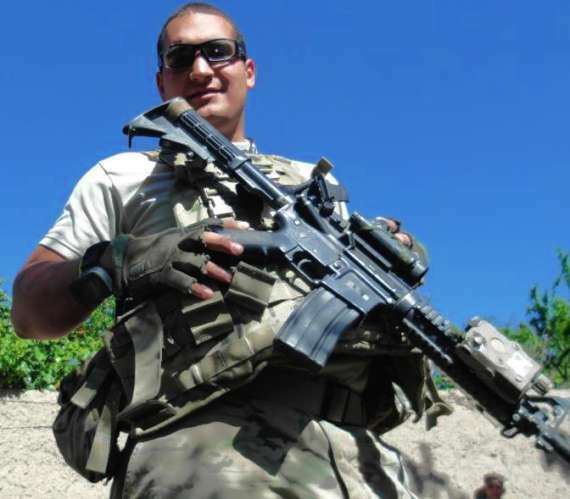 Jonathan Batista, 22, of Kinnelon, N.J., died July 8, in Zharay, Kandahar province, Afghanistan, when enemy forces attacked his unit with small arms fire. He was assigned to the 2nd Battalion, 321st Airborne Field Artillery Regiment, 4th Brigade Combat Team, 82nd Airborne Division, Fort Bragg, N.C. "Jon was a devoted son, a caring brother, a Paratooper dedicated to the safety and security of his Infantry team and a newlywed," Lt. Col. Philip Raymond, Batista's battalion commander, said in a press release. "As a soldier, he represented the qualities and values that make our nation great." Spc. 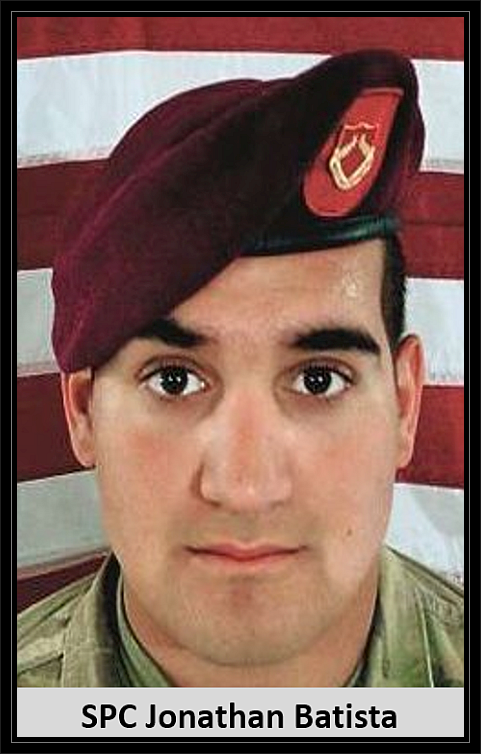 Jonathan Batista, 22, was killed in action while serving in Afghanistan on July 8, 2012. Born in New York City, Jonathan grew up in Rutherford before moving to Kinnelon 3 years ago. He was proudly serving his country as a paratrooper in the US Army's 82nd Airborne Division in the Zharay province of Afghanistan. This was his first deployment to Afghanistan. Jonathan has been awarded several medals, including the Purple Heart and the Bronze Star Medal. Jonathan is survived by his parents, Jeannette and Erik Gaston; his brother, Andrew Gaston; his sister, Gabriella Gaston; his grandparents, Mercedes Castillo, Sonia and Pedro Batista, and David and Beverly Gaston; and many close relatives and friends. Jonathan loved spending time with his many friends, who easily took to him and his charismatic personality. The family will receive visitors at Our Lady of the Magnificat RC Church, Kinnelon from 4 to 8 pm on Sunday, July 15. A funeral Mass will be held 10:30 am Monday and interment will follow at the church cemetery. In lieu of flowers, donations in Jonathan's memory to the Wounded Warrior Project, PO Box 758517, Topeka, KS 66675 would be greatly appreciated by his family. 1. The flag of the United States of America and the flag of New Jersey shall be flown at half-staff at all State departments, offices, agencies, and instrumentalities during appropriate hours on Wednesday, July 18, 2012, in recognition and mourning of a brave and loyal American hero, United States Army Specialist Jonathan Batista. GIVEN, under my hand and seal this 16th day of July, Two Thousand and Twelve, and of the Independence of the United States, the Two Hundred and Thirty-Seventh. Kinnelon will honor U.S. Army Specialist Jonathan Batista, who was killed in combat in Afghanistan this month, by placing a bronze plaque outside the borough’s flagpole memorial. Mayor Robert Collins announced the plan for the plaque, which will be dedicated Memorial Day 2013, during the borough council meeting Thursday. Collins also ordered that all flags in the community be flown at half mast until Aug. 8 in honor of Batista, 22. According to the Department of Defense, Batista, a paratrooper with the 82nd Airborne Division of the U.S. Army, was fatally wounded by enemy small arms fire while supporting Operation Enduring Freedom in the Kandahar province of Afghanistan. He joined the Army as an infantryman on March 16, 2010, and was serving his first deployment to Afghanistan when he was killed. When Batista died, he was with the A Battery, 2nd Battalion, 321st Airborne Field Artillery Regiment, 4th Brigade Combat Team. Batista is a recipient of the Purple Heart, Bronze Star Medal and several other honors. On Thursday, Collins read a proclamation from the borough calling for Batista to be honored for “the ultimate sacrifice to his country and fellow soldiers.” The proclamation was read aloud by Collins and presented to members of Cub Scout pack 277, of which Batista’s younger brother, Andrew, is a member. Batista's funeral was held Monday at Our Lady of the Magnificat Church and hundreds of relatives and friends attended. According to his obituary, Batista is remembered as having a "charismatic personality." “The understanding and caring which Jonathan Batista gave to others will stand as a monument to a true fine person,” Collins read at Thursday's meeting. Councilman Ronald Mondello relayed a story that his son, Nicholas, who attended the Kinnelon summer recreation program with Andrew Batista, had told him depicting the younger Batista’s admiration for his older brother, who served his platoon as a mine detector operator. During the council meeting, Collins called out a number of high-ranking government officials, including Lt. Gov. Kim Guadagno and U.S. Rep. Rodney Frelinghuysen, who attended the wake and community welcoming event on Kinnelon Road on Sunday and Monday’s funeral service. None of Batista’s family members were present at the council meeting. Collins reminded the community that anybody who is interested can make a contribution, at the family’s request, to the Wounded Warrior Project. KINNELON — Army Spc. Jonathan Batista was a proud soldier. He was a giving friend. And, according to his stepfather, he was kind of a frightening driver. "He as a very distinguished service record. He also has a very distinguished driving record," Erik Gaston said Monday morning, recalling how his son got his first speeding ticket three hours after getting a driver's license. Gaston's comment brought smiles to a solemn moment, as hundreds of friends, family members, servicemen and servicewomen, local emergency officials and dignitaries gathered to remember Batista at Our Lady of the Magnificat Roman Catholic Church in Roman. 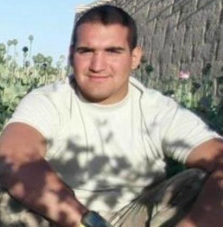 Batista, who moved to Kinnelon three years ago, was killed July 8 in Zharay, a part of Afghanistan's Kandahar province. He was on his first tour, working as a mine detector. The day before the funeral Mass, hundreds of people lined Kinnelon Road to pay their respects to Batista's family. Gaston said it's a sign of how "community comes together, how people come together, how strangers come together." He told the congregation he came into Batista's life at something of a late stage — Batista was 9 years old, and until then, had been raised only by his mother, Jeannette Gaston, and her family. Erik Gaston said he vowed to do all he could for his new son. He taught him to play baseball. He taught him to ski. He taught him to stand up for what's right, and to face adversity. And when Erik Gaston married Batista's mother, he said, he asked Batista what he wanted. The answer: "I want a younger brother and a dog." "Those were big requests. Thank God we were able to fulfill them," Erik Gaston said. Jonathan Batista, 22, shown in his Facebook photo.But since Batista wasn't Erik's biological son, he said, he always doubted he'd be able to do the one thing a father should — love his son unconditionally. Yet when Gaston learned of Batista's sacrifice, he said, and the initial crush of the loss passed, he was filled with a sense of peace. It's because, he said, he'd found that unconditional love. "We love you," Erik Gaston said. "We love you for who you are." While many of those in attendance were there to honor Jonathan Batista, the soldier, some were there for Jonathan Batista, the longtime friend. "Jonathan was one of the most generous people I knew," Laura Pellegrino, who grew up with Batista in Rutherford, said after Batista's body was laid to rest in the church's cemetery. "He did everything with a full heart." During the service, another friend, James Parnofiello, told the congregation he would always remember Batista's honesty, free spirit and infectious smile. He said joining the Army gave Batista purpose, and Basista's commitment filled his loved ones with pride. "I hope I am everything to you you are to me," he said to his fallen friend. John Pierce, a priest who took part in the ceremony, had served in Vietnam. He said after the burial that he's proud to see communities honor their soldiers, noting they didn't always show the same respect during his time of service. "These guys really stepped up for to fight global terrorism," he said. That's the spirit that brought Louise Giacoio to the service. Giacoio said her daughter knows Batista's mother, but she had never met Batista personally. "I just felt I had to be here," she said. "I felt it would be my honor." Batista is survived by his parents, Jeannette and Erik Gaston; his brother, Andrew Gaston; his sister, Gabriella Gaston; and his grandparents, Mercedes Castillo, Sonia and Pedro Batista, and David and Beverly Gaston. His family has asked that in lieu of flowers, donations be made in his memory to the Wounded Warrior Project, P.O. Box 758517, Topeka, Kan. 66675. KINNELON — A young Army paratrooper from the borough has been killed in Afghanistan, the Defense Department announced Monday. Jonathan Batista, 22, a member of the 82nd Airborne Division based at Fort Bragg, N.C., was on his first deployment in Afghanistan when enemy forces attacked his unit with small-arms fire on Sunday, the Pentagon said. Batista, who recently married, is a 2007 graduate of Rutherford High School. “Jon was a devoted son, a caring brother, a paratrooper dedicated to the safety and security of his infantry team, and a newlywed,” said Lt. Col. Philip Raymond, Batista’s battalion commander. As a soldier, Batista represented the best qualities and values “that make our nation great,” Raymond said. Batista served his platoon as a mine detector operator, clearing paths for his unit as they patrolled throughout the farmland of Zharay, Kandahar Province. Nick Jameson, who attended Rutherford High School with Batista, said his friend enjoyed baseball, was a Red Sox fan and joined the Army because “he wanted to better himself.” Jameson appeared distraught and said he couldn’t say much more. “He was a really good guy; he was nice to everybody,” Jameson said. Batista’s awards include the Bronze Star Medal, the Purple Heart, Army Achievement Medal, Afghanistan Campaign Medal, NATO medal, Combat Infantry Badge and Parachutist Badge.